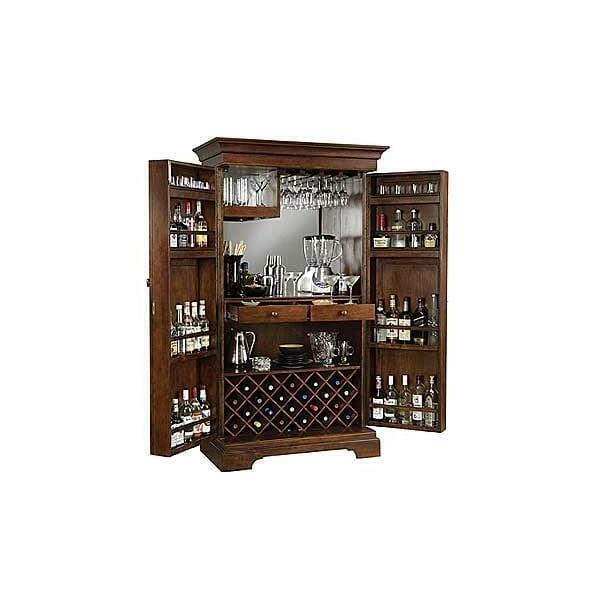 This Hide-A-Bar™ cabinet features a raised door panel and room to store 22 wine bottles with a generous amount of room for liquor storage. A wooden stemware rack keeps wine glasses at convenient reach. 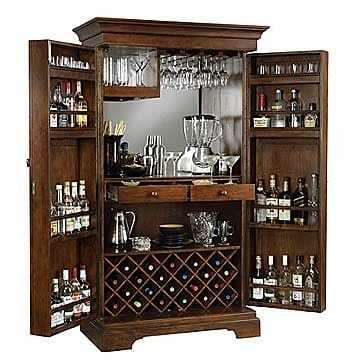 An upper fixed shelf may hold glasses and tumblers. A 3x power strip outlet is located on he center shelf for operating small appliances. Two drawers provide ample utensil storage and feature quality dovetail construction with smooth running metal slides. Laminated lift-up shelves are located inside the two drawers for additional work surface area. 180 degree door hinges allow doors to open wide for serving. Finished in Americana Cherry on select hardwoods and veneers. Auto-on Light is a "smart" light switch that turns on automatically when a door is opened, and off when closed. Adjustable levelers under each corner provide stability on uneven and carpeted floors. Locking door for added security. This item requires freight delivery. This shipping method uses a full size semi - truck and product can be delivered to a street side location or into a room of choice based on the level of service requested. A representative will call to schedule your delivery which will require a signature upon receipt. Most delivery times within the Continental U.S. range from 5-7 days.